I am the proud owner of my dad's 1965 Ventures II model Mosrite. 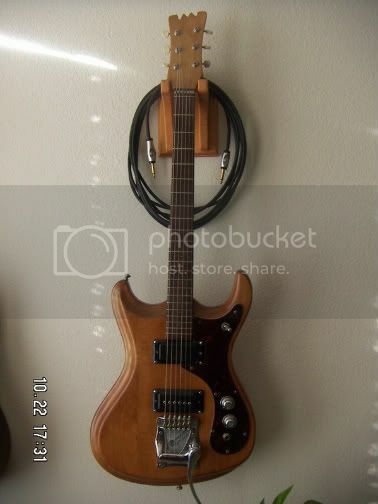 I was long told it had no value since he refinished it and removed the headstock decals (cir. mid 1970's, when it had little market value). I still play this guitar regularly, though it rarely leaves my home - I love the smooth, low action, and warm tone - so though it may have limited collector value, she's a great playing guitar and I love it. I've recently thought of restoring it to it's original color and trying to find some replacement headstock decals (or making my own), so expect to see some questions regarding these topics from me soon. Anyway, I've uncovered some history on this guitar that even my dad had forgotten and I'm always looking for more info. Howdy and welcome to the forum. That's great that you have your Dad's guitar. Don't be misled into believing it has no value since it's been refinished. Yeah, to a high end collector they would want it untouched. But it still has value in it's present state and if professionally restored would only increase it's value. Regardless of it's condition, just enjoy the guitar. Welcome, SMP ... Lots of info here, and helpful guys with all your Mosrite woes. I got replacement headstock decals from a guy on eBay, waterslides, and they worked out great. Again, welcome to the forum. Yes, welcome to the board. I agree with the guys, the value of your guitar is even greater because it was your dad's. You can choose to restore it or leave it as he modded it. Either way, you've got a great guitar. Yes indeed! I've admired your VII in particular bushers - pretty much how I imagine mine would look after a restore. I'm stuck in my cubicle right now, so the only pics at my disposal are historical and they aren't very good quality. 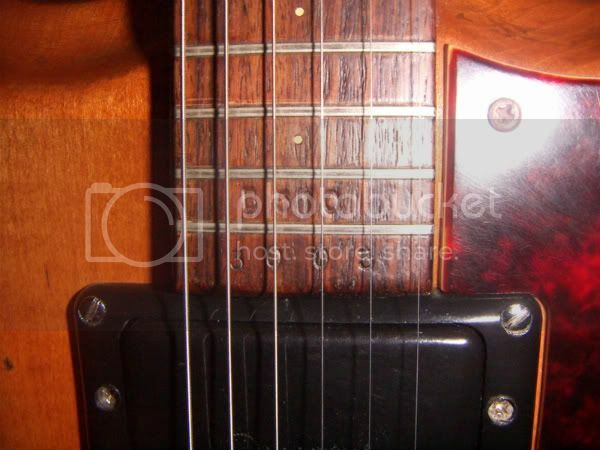 As you can see in the pic it originally had the slab body - however, a crack formed in the body near the neck and my dad sent it back for lifetime warranty service - it returned with a carved body, different pickguard (maybe a different tremolo too?) -- possibly everything south of the neck was replaced. I'll get some current pics this evening when I return home. What kind of History does this little guy have that your Dad forgot about??? LOL! Well, when he first sent me the pic I just posted above I told him it looks as if the body/pickguard are different than what I have now. He said he had forgotten all about the fact that he had sent it back to have the crack in the body "repaired" by Mosrite. Also, when he gave it to me 25 yrs ago, he told me he got when he was 14 - dating it to a 1964 model. 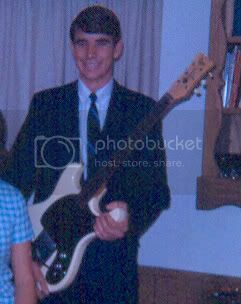 After I did some research I told him it looked as if it was probably later - like 1965-66, ofcourse this also triggered his memory - he then admitted he was older and it was most likely a 65-66. Ah! I wondered why that was gone after I posted my reply.